Amongst the bevy of awesome presents I was lucky enough to receive for Christmas, was the Universal Monsters blu-ray boxset. I always buy (or rent) films. I have neither the technical know how or desire to download films illegally. I know not everyone else feels the same way, but the incredible presentation of this boxset is a reminder why buying is always the best option (or maybe I’m just a 26 year old dinosaur whose house is full of vinyl, CDs and rows upon rows of DVDs, blu-ray and still some VHS). The boxset includes 8 films, an awesome booklet, killer postcards and a whole bunch of extras that accompany all of the movies. In addition to that, the transfer of the films to blu-ray looks absolutely stunning, the money has obviously been spent to do the hard work on this and the images really pop as a result. Best blu-ray transfer I have seen I think. In short, if you are at all interested in these films, then I would highly recommend forking out the coin to get your hands on one of these boxsets. 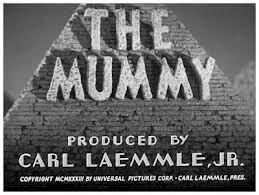 So I thought I should start working my way through reviewing the set, and thought I would kick it off with The Mummy (1932) which I had never seen before. I am sure that far smarter film analysts have discussed what separates these films from other monster films and why they are thought of so highly. For me, amongst other things, they are just so well shot. The camerawork is assured and interesting whereas other B movies (or B movies trying to be A movies) are clunky, boring and ineptly filmed, which makes enjoying them a lot tougher. Narratively, The Mummy is pretty stock standard stuff. Poms in Egypt on an archaeological dig. In the interests of academic knowledge, they ignore the curse that is on a casket that they find. Such a bad move. Doing so releases Boris Karloff in all his bandage wrapped glory. Actually he is only in the bandages in the first scene, following that, he spends the rest of the film in some incredible makeup design. The opening of the casket is one of my favourite scenes in the film, toying with audience expectations that must have existed even when the film was first released. When it is opened, it is obviously tense, with the audience waiting for the inevitable terror to take place. But there is nothing but silence, as the archaeologist silently goes about his work. 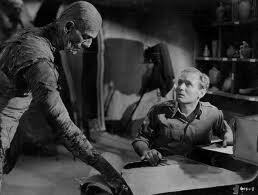 Director Karl Freund continually teases the mummy coming to life, but doesn’t give it to us. Just continues the silence. Then, when the big moment finally comes, it is not a big ‘jump’ scare as you might reason would be coming, rather the mummy slowly and naturalistically opens his eyes, extends his limbs like he is trying to shake a couple of thousand years of stiffness and then makes his move. The realism continues as the impetuous young archaeologist who had opened the casket goes mad in an instant when he realises what has been released. Flash forward 10 years and there is another archaeological team (with the son of one of the original party member’s involved) in the area. The mummy is still around, sans bandages, and searching for the reincarnation of the love of his life from a few millennia earlier (these monsters, just like us, are always on the lookout for love). And you can basically figure the rest out for yourself (especially if you have seen the Brendan Fraser starring remake). The film stars the most famous of Universal’s monster stars (just beats out Bela Lugosi due to the number of films he made) Boris Karloff. He plays it beautifully, but pretty Frankensteiny. That’s not to say his performance is wooden at all, he really is a very good actor especially in the occasional close-ups which are chillingly creepy. Perhaps that is another thing that sets these monster flicks apart from others, especially contemporary ones, a much higher standard of actor. Karloff’s makeup looks amazing though, and makes you yearn for the days where the default response to anything difficult was not just ‘we’ll do it in post-production with CGI’. The other really excellent performance in the film, perhaps even better than Karloff’s is from Zita Johann who plays his love interest Helen Grosvenor. It is a strange role because she plays someone in a trance for much of the film, which is definitely not easy to do, but she does it very well. 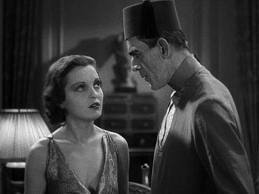 Showcasing the almost lost art of film makeup and a vintage Boris Karloff performance, The Mummy is a lot of fun. 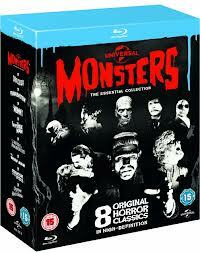 If you have an interest in classic filmmaking or monster films then definitely check this one out. Or if you are keen to see what all the fuss is about with Universal’s iconic monster films, then this is as good a place as any to start. Like what you read? Then please like Not Now I’m Drinking a Beer and Watching a Movie on facebook here. Got this for Christmas as well! Great review of a classic film man. Can’t wait to see what u think of the other films. Cheers man. Yeah, I will work through them all on here slowly, except for The Wolfman which I reviewed a couple of years ago. Which is your favourite of them? I’ve always loved Creature from the Black Lagoon and The Invisible Man. It’s a brilliant boxset, definitely a reason not to go down the pirating or even legally downloading route. I haven’t got round to watching this one yet, but intend to soon. Also very interesting point you made about these monsters looking for love. Thinking about it, it is often that way. Even stuff like King Kong has all that going on. One of my favorite classic horror films. It’s always fun to watch. Nice review. My brother had this on his list but i got him some other stuff instead. I think I may have shattered his faith in Santa Claus. 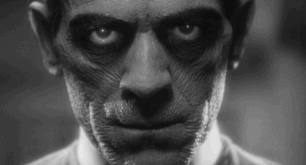 Karloff is crazy creepy in this one. Looking forward to checking out your Creature From the Black Lagoon review. Creature From the Black Lagoon has gotten a reasonable amount of love from commenters. Will have to get on that. Hopefully your bro’s love of Santa can overcome that hurdle. I’m sure it will. Awesome post. I should check out this movie. That Blu-Ray set looks amazing! Yeah the set is definitely highly recommended from me man.